On 1 January 2000, the Australian Air League’s Coolangatta Squadron was closed. Now 17 years later, the squadron has been reformed under the name of Coolangatta/Tweed Squadron. 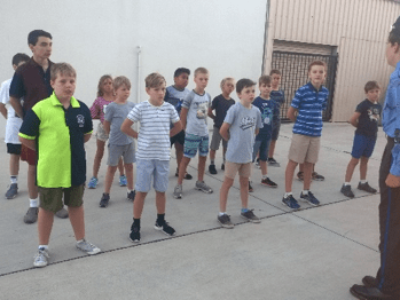 The re-formed squadron’s initial parade night was held on 3 February with a good number of parents and cadets/prospective cadets attending to examine the squadron’s new headquarters which will be at Air Gold Coast’s pilot training facilities. On the night, many membership applications were distributed and now at the time of writing 3 weeks on, the squadron has 11 league and 6 associate members signed up with an additional 4 league members being processed and 3 prospective cadets trialling. Cadets level of enthusiasm rose significantly when cadets were being measured for their formal uniforms. Given these excellent early signs it is anticipated that squadron numbers will grow quickly. The premises of Air Gold Coast are first class with views from the building reaching out to Gold Coast airport’s main runway and control tower. With several aircraft and two flight training simulators located within the building, this provides an environment that will be a great encouragement for young cadets to develop their knowledge of aviation via the many aviation theory subjects offered by the Air League. Under the enthusiastic leadership of our two Trainee Officers Glenn Raine and Damian McConnell and the strong support being offered by Air Gold Coast the future for the squadron looks to be in good hands and we wish them every success.